The Aral Sea ( Kazakh: Арал Теңізі (Aral Tengizi), Uzbek: Orol dengizi) is a landlocked endorheic sea in Central Asia; it lies between Kazakhstan in the north and Karakalpakstan, an autonomous region of Uzbekistan, in the south. Since the 1960s the Aral Sea has been shrinking, as the rivers that feed it (the Amu Darya and the Syr Darya) were diverted by the Soviet Union for irrigation. 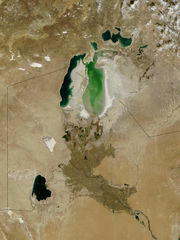 The Aral Sea is heavily polluted, largely as the result of weapons testing, industrial projects, and fertilizer runoff before and after the breakup of the Soviet Union. The major ecological problem is that diversion of the Amu Darya and Syr Darya rivers for irrigation has shrunk the Aral Sea dramatically; the Aral Sea has been drying up for about 40 years. This has brought about a number of ecological and economic problems for the sea and the surrounding area. The irrigation canals began to be built on a large scale in the 1930s. Many of the irrigation canals were poorly built, letting water leak out or evaporate; from the Qaraqum Canal, the largest in Central Asia, perhaps 30–70% of the water went to waste. 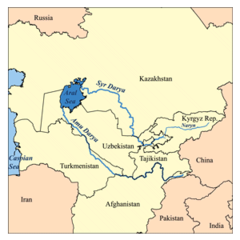 Today only 12% of Uzbekistan's irrigation canal length is waterproofed. By 1960, somewhere between 20 and 50 cubic kilometers of water were going each year to the land instead of the sea. Thus, most of the sea's water supply had now been diverted, and in the 1960s the Aral Sea began to shrink. From 1961 to 1970, the Aral's sea level fell at an average of 20 cm a year; in the 1970s, the average rate nearly tripled to 50–60 cm per year, and by the 1980s it continued to drop, now with a mean of 80–90 cm each year. Even seeing this, the rate of water usage for irrigation continued to increase: the amount of water taken from the rivers doubled between 1960 and 1980; cotton production nearly doubled in the same period. 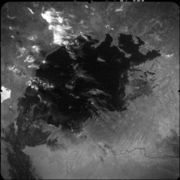 The disappearance of the lake was no surprise to the Soviets; they expected it to happen long before. 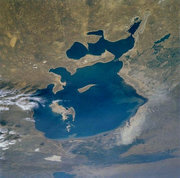 The Soviet Union apparently considered the Aral to be "nature's error", and a Soviet engineer said in 1968 that "it is obvious to everyone that the evaporation of the Aral Sea is inevitable". Human Impacts are that the people who are living around the area are drinking the water and getting sick off it because the salt level is too high for them to drink. The sea's surface area has shrunk by approximately 60%, and its volume by almost 80%. In 1960, the Aral Sea was the world's fourth-largest lake, with an area of approximately 68,000 km² and a volume of 1100 km³; by 1998, it had dropped to 28,687 km², and eighth-largest. Over the same time period its salinity has increased from about 10 g/l to about 45 g/l. As of 2004, the Aral Sea's surface area was only 17,160 km², 25% of its original size, and still contracting. Work is being done to restore in part the North Aral Sea. Irrigation works on the Syr Darya have been repaired and improved to increase its water flow, and in October 2003, the Kazakh government announced a plan to build a concrete dam ( Dike Kokaral) separating the two halves of the Aral Sea. Work on this dam was completed in August 2005; since then the water level of the North Aral has risen, and its salinity has decreased. As of 2006, some recovery of sea level has been recorded, sooner than expected. "The dam has caused the small Aral's sea level to rise swiftly to 125 feet, from a low of less than 98 feet, with 138 considered the level of viability." Economically significant stocks of fish have even been returned, and observers who had written off the North Aral Sea as an environmental catastrophe will be surprised by unexpected reports that in 2006 its returning waters already were partly reviving the fishing industry and producing a catch for export as far as Ukraine. The restoration reportedly gave rise to long absent rain clouds and possible microclimate changes, bringing tentative hope to an agricultural sector swallowed by a regional dustbowl, and some expansion of the shrunken sea. "The sea, which had receded almost 100 km south of the port-city of Aralsk, is now a mere 25 km away." 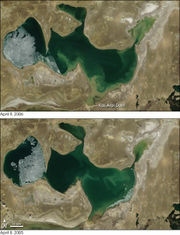 The South Aral Sea, which lies largely in poorer Uzbekistan, was largely abandoned to its fate, but the project in the North Aral has brought at least faint glimmers of hope: "In addition to restoring water levels in the Northern Sea, a sluice in the dike is periodically opened, allowing excess water to flow into the largely dried-up Southern Aral Sea." Discussions are underway to possibly recreate a channel between the somewhat improved North and the desiccated South, along with ambitious but uncertain wetland restoration plans throughout the region. As it has dried, the South Aral has left behind vast salt plains, producing dust storms, and making regional winters colder and summers hotter. Attempts to mitigate these effects include planting vegetation in the newly exposed seabed. The ecosystem of the Aral Sea and the river deltas feeding into it has been nearly destroyed, not least because of the much higher salinity. The receding sea has left huge plains covered with salt and toxic chemicals, which are picked up and carried away by the wind as toxic dust and spread to the surrounding area. The land around the Aral Sea is heavily polluted and the people living in the area are suffering from a lack of fresh water and other health problems, including high rates of certain forms of cancer and lung diseases, just to name a few. Crops in the region are destroyed by salt being deposited onto the land. The town of Moynaq in Uzbekistan had a thriving harbour and fishing industry that employed approximately 60,000 people; now the town lies miles from the shore. Fishing boats lie scattered on the dry land that was once covered by water, many have been there for 20 years. The only significant fishing company left in the area has its fish shipped from the Baltic Sea, thousands of kilometres away. The tragedy of Aral coast was portrayed in "Psy" ("Dogs"), a motion picture by Dmitriy Svetozarov ( USSR, 1989). The film was shot on location in the actual ghost town, showing scenes of abandoned buildings and scattered vessels. Redirecting water from the Volga, Ob and Irtysh rivers. This would restore the Aral Sea to its former size in 20-30 years at a cost of $30-50 billion. In January 1994, the countries of Kazakhstan, Uzbekistan, Turkmenistan, Tajikistan and Kyrgyzstan signed a deal to pledge 1% of their budgets to helping the sea recover. By 2006, the World Bank's restoration projects especially in the North Aral were giving rise to some unexpected, tentative relief in what had been an extremely pessimistic picture. In 1948, a top-secret Soviet bioweapons laboratory was established on the island in the middle of the Aral Sea (now disputed territory between Kazakhstan and Uzbekistan). The exact history, functions and current status of this facility have not yet been disclosed. The base was abandoned in 1992 following the disintegration of the Soviet Army. Scientific expeditions (including American) proved that this had been a site for production, testing and later dumping of pathogenic weapons. In 2002, through a project organized by the United States and with Uzbekistan assistance, 10 anthrax burial sites were decontaminated. According to the Kazakh Scientific Centre for Quarantine and Zoonotic Infections, all burial sites of anthrax were decontaminated. Ergash Shaismatov, the Deputy Prime Minister of Uzbekistan, announced on August 30, 2006 that the Uzbek government and an international consortium consisting of state-run Uzbekneftegaz, LUKoil Overseas, Petronas, Korea National Oil Corporation, and China National Petroleum Corporation signed a production sharing agreement to explore and develop oil and gas fields in the Aral Sea, saying, “The Aral Sea is largely unknown, but it holds a lot of promise in terms of finding oil and gas. There is risk of course but we believe in the success of this unique project." The consortium was created in September 2005.